Professor Ian Diamond will succeed Professor Sir Duncan Rice on 1 October 2010. The University of Aberdeen has appointed its new Principal and Vice Chancellor. Professor Ian Diamond FBA FRSE, the Chief Executive of The Economic and Social Research Council (ESRC), will succeed Professor Sir Duncan Rice on 1 October 2010. Announcing the appointment, Sir Moir Lockhead, Senior Governor of Court the University’s governing body, said: “Court has unanimously confirmed the appointment of Professor Diamond to lead the institution through the next stage of its ambitious strategy to become a truly world leading university. The ESRC is the UK's leading agency for research funding and training in economics and social sciences. 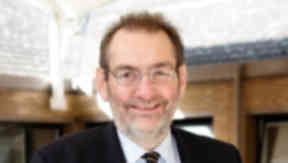 Professor Diamond has also chaired the Executive Group of Research Councils UK, the body representing all seven UK Research Councils, from 2004 until 2009. He is a renowned social statistician, who has worked extensively in the area of population and health, both in the developed and less developed world. Prior to joining the ESRC Ian Diamond studied at the University of Southampton where he was appointed a lecturer in 1980, rising through the ranks to become Deputy Vice-Chancellor in 2001. He was elected to the UK Academy of Social Sciences in 1999 and a Fellow of the British Academy in 2005. He has received honorary degrees from the Universities of Glasgow and Cardiff. Professor Diamond said “I am delighted to have the opportunity to steer this rising star in the north through the next stage of its mission to be rated among the world’s top universities. “The achievements of recent years combined with the commitment and ambition of my new colleagues gives us the best possible advantage in firmly positioning the University as a major international centre of learning and research. Professor Diamond will succeed Professor Sir Duncan Rice who will have been at the helm of the university for 14 years. To aid transition, Professor Diamond will be Principal-Designate from 1 July 2010.